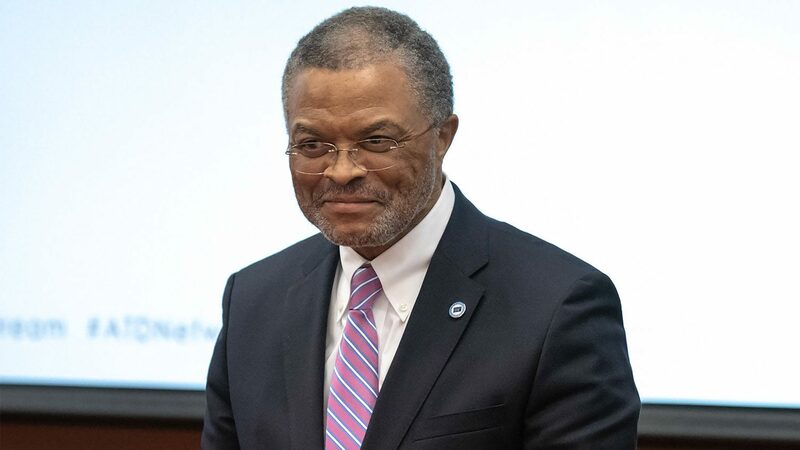 RALEIGH, N.C.—Alamance Community College President Algie Gatewood ’94EDD has received the NC State College of Education’s 2018 I.E. Ready Distinguished Leader Award, which recognizes alumni with distinguished careers with the North Carolina Community College System. Dr. Gatewood is “an exemplary leader who sets high expectations for all of us but who every day makes an impact and changes the lives of individuals in Alamance County,” said NC State Education Dean Mary Ann Danowitz when presenting Gatewood the award during the Dallas Herring Lecture Wednesday, Nov. 28, at the college’s Friday Institute for Educational Innovation. Gatewood has worked in community college and higher education administration for over 30 years. He has been president of the Alamance Community College since October 2013. As president, he has continually realigned Alamance Community College with the needs of the region and students, and he has built community partnerships that are strengthening the county. One recent example is the opening of the Advanced Applied Technology Center, which houses five dynamic and high-tech programs offered at Alamance Community College. Gatewood has also partnered with two local advanced manufacturers, GKN and Sandvik, to design and launch a Mechatronics Engineering Technology program that is equipping Alamance residents with new high-tech skills. The new Career Accelerator Program at Alamance Community College is supporting the mechatronics program by providing a direct pathway into local manufacturing jobs. The I.E. Ready Award honors the memory and legacy of I.E. Ready, who served as the first leader of the North Carolina Community College System and was a professor emeritus with NC State’s Adult and Community College Education program. Ready envisioned and worked toward a community college system that provides a total education to students and expands educational opportunities.